Michael Hoey is five shots off the pace at the halfway stage of the Russian Open in Moscow after he fired a five-under-par 66 on Friday. Hoey recovered from his only dropped shot of the day at the second to post six birdies, including an impressive up and down from a bunker at the last. The Belfast man is sharing 10th spot five behind leader Bradley Dredge. 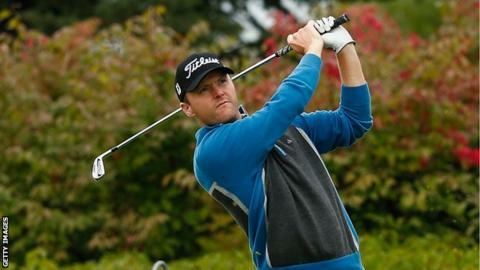 Brian Casey secured weekend play after a 68 left him two under with Damien McGrane set to survive on level par. McGrane's level-par total, after his 72 on Friday, looked like being the cut mark while Niall Kearney was also on course to play over the weekend after moving to two under after 16 holes. Despite a top-10 finish in the Czech Masters last week, McGrane is currently only 166th in the Race to Dubai standings and he will need some impressive finishers over the coming weeks to avoid a trip to the Tour School. However, Peter Lawrie's hopes of improving his current 119th spot in the order of merit look likely to be dashed after a 72 left him on one over and looking certain to exit. The other Irish player in the field Kevin Phelan will have the weekend off after a 75 left him on four over. Hoey's tour card for 2016 looks safe after moving up to 77th in the Race to Dubai standings following some decent form over the past couple of months. Welshman Dredge leads on 10 under after a second straight 66 with England's Lee Slattery a stroke behind after firing a 67 on Friday.